The sanitary history of cities. Dan Snow gets down and dirty in medieval grime to discover how the London of today was forged in the filth of the 14th century. 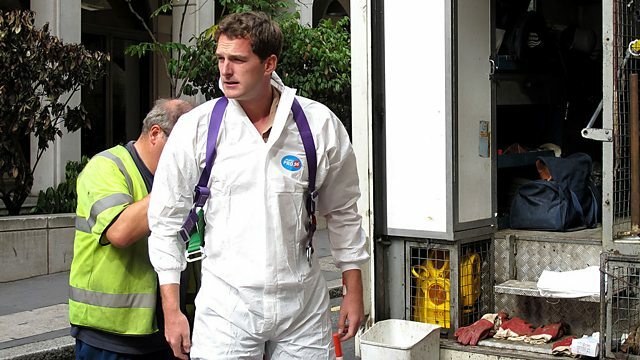 Historian Dan Snow gets down and dirty in medieval grime to discover the hard way how the London we know was forged in the filth of the 14th century. State-of-the-art CGI reveals London's streets as they were 700 years ago, and Dan steps into the shoes of a medieval Londoner - wooden platforms designed to help him rise above the disgusting mess underfoot. He spends the night as a medieval muck-raker shifting a staggering six tonnes of excrement, and has a go at medieval butchery to find out what the authorities were up against. He also examines the remains of a plague victim to discover how a catastrophic epidemic would help a new and cleaner London emerge from the muck of the past. Medieval London - 6 tonnes of manure!